​​​​​​​​​​​Ben Wilson. was born in Philadelphia, and moved with his parents to NYC where he received his art education at the National Academy of Design, and at the Educational Alliance. As a talented artist, Wilson was singled out by the New York Times as a discovery even before he had his first solo show in 1946. A WPA artist, Wilson's early works identified strongly with the plight of the Jewish people in Europe and the Holocaust. After the war, Wilson's spent 1952-54 in Paris studying at the Academie Julian. 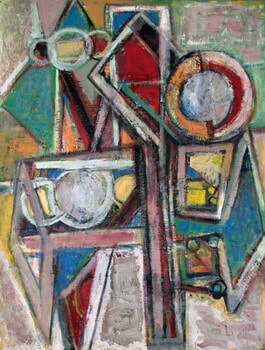 He was influenced by Cubism yet towards the end of the 1950's he moved towards abstraction which continued to evolve throughout the remainder of his life. Wilson exhibited extensively throughout his career, including The Society of Independent Artists, the National Academy of Design, the Pennsylvania Academy of Fine Arts, the Montclair, NJ, Art Museum, and the Newark Art Museum, to name a few. A consummate draftsman, Wilson had more than 30 one-man gallery shows, and spent more than 50 years teaching art including several years at the City College of New York, and New York University.